The filtration system is the single most important factor in maintaining a healthy environment and healthy fish. An article in Aquarium Fish Magazine estimates that more than 80 percent of all fish health problems in aquariums are directly linked to improper or inadequate filtration. There are several types of filters used by today's hobbyists. An undergravel filter is the very least a tank needs to stay healthy. An undergravel filter is a slotted plate situated inside the aquarium on the bottom glass under the aquarium gravel. Air bubbles or power heads are used to pull water down through the gravel and up through the lift tubes. During this process, large particles are trapped in the gravel so that they are not suspended in the water - mechanical filtration. Additionally, nitrifying bacteria live on the surfaces of the individual gravel grains and "processes" the water as it goes by, converting ammonia to nitrite and nitrite to nitrate - biological filtration. An undergravel filter plate should cover the entire bottom of the tank, and the gravel bed should be 2 to 3 inches thick. Gravel should have an average diameter of 3 millimetres (1/8 inch) to ensure lots of surface area for bacteria to grow on while providing enough space among the pieces to permit good water flow with minimal clogging. Water flow through the filter should be between 0.5 and 1.5 gallons per minute for each square foot of aquarium bottom area. Should the undergravel filter bed become partially clogged with particulates, the water will channel around those areas and reduce nitrifying (biological cleansing) activity - the process of converting ammonia to nitrite to nitrate. The result will be rising concentrations of ammonia. Meanwhile, without oxygenated water passing through some areas of the gravel, anaerobic regions (areas with minimal amounts of oxygen) will develop and become inhabited by undesirable bacteria (e.g., heterotrophic bacteria that produce deadly hydrogen sulfide gas, which smells like rotten eggs). If the gravel bed becomes totally clogged, the nitrifying bacteria (beneficial bacteria) will die and heterotrophic bacteria (undesirable bacteria) will take their place. There are two ways to deal with this problem. One is to use a hydro-cleaning device, sometimes known as a gravel "vacuum." When siphoning water from the tank, the gravel is churned about in the large end of the siphon hose and the particulate matter is removed while the gravel remains in the tank. The other method is to use efficient mechanical filtration to remove most of the solid material before it settles into the undergravel filter. Some people add a tank-mounted filter (below) as a supplemental mechanical filter to pull particulates from the water rather than have all of them drop to the bottom of the tank and begin to clog the gravel. An undergravel filter is the least expensive and most common of all filters. It requires a filter plate and a pump or power-heads. 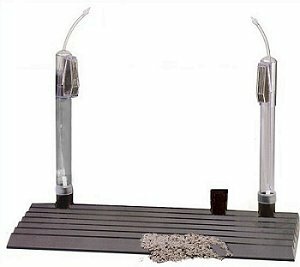 Power heads usually give the undergravel filter a boost in that they move the water through the filter with the most speed and agitation. Tank mounted filters usually hang on the outside of the tank. They pull water out of the tank and let it trickle back into the tank. During the process, the water is passed through at least one and usually two filter pad inserts. The first traps any large debris that may be floating in the tank. The other allows nitrifying bacteria to grow on its surface so that biological filtration can also occur as the water trickles through. The water pours back into the tank, dropping through a small amount of air space like a mini waterfall, which agitates the surface of the water and enhances the oxygenation of the tank. It is very important to keep the mechanical filter pad clean. If it gets clogged, the water will bypass that pad and hit the biological filter pad full of particulates which will also soon clog the second insert. However, it is equally important that you not continually disturb the second or biological pad. Too fastidious a cleaning or using chlorinated water to wash the second pad can destroy the beneficial bacteria which are cleaning the tank. Tank-mounted filters are a very good supplemental filter. 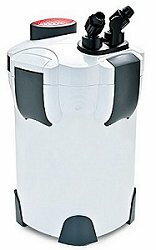 They are not as expensive as most canister or wet/dry filters (below). Adding a tank-mounted filter to you existing tank will enhance the water quality because it will provide more filtration. More and better filtration will allow you to keep more fish in the same tank. Canister Filters are one of the most popular and best types of filters. They provide all three types of filtration: mechanical, chemical, and biological filtration for larger tanks or tanks with lots of fish, but they take up less room than wet/dry filters (below). Some are so good at particulate filtering that they can actually be called a water polishing filters. Depending on the model, they will contain one, two, or three media baskets. The idea is to push the water through the baskets, pulling pollutants out of the water as it passes through the media held in the basket. Canister filters take a little more work to set up (although they are getting more sophisticated every day), but their capacity and filtering ability are much better than power filters. Media needs to be changed or cleaned. Most have convenient snap-closures and some have quick disconnect hoses to make maintenance of the filter easy. Some are self-priming to make re-starting a breeze. They can be used for freshwater, saltwater, and cichlid tanks. Another type of filter is the wet/dry filter. Wet Dry filters (also known as trickle filters) work on the same principle as undergravel filters (pulling water through a nitrifying filtering bed), but implement the concept differently. The trickle filter's biological filtering bed is outside of the tank. Aquarium water enters at the top of the filter column and trickles downward through the medium bed (e.g., stone, specially designed plastic media, fiber materials, etc. ), which is not submerged, thereby collecting oxygen in the process. The nitrifying bacteria inhabit the surface of the medium and process (clean) the water as it trickles by. The water then collects at the bottom of the filter column and is pumped back to the tank. This design provides for efficient nitrification, as well as good aeration (oxygenation) of the water. Some of the better commercial trickle filter designs incorporate drawers for mechanical filtering media and GAC (high quality granular activated carbon) so that the entire filtration system is built into one unit. Trickle filters are particularly well suited for marine aquariums, where dissolved oxygen levels are low, and for freshwater aquariums that use a soil substrate for plantings, making undergravel filtration impossible. 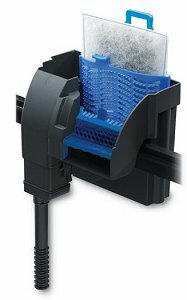 Unlike the undergravel filter, clogging is not a problem with trickle filters. For best operation, the volume of the trickle column should equal about 8 to 10 percent of the tank volume. The water flow rate should be 4 to 5 times the tank volume per hour. For the most efficient nitrification, the filter surface area should be designed to yield 0.5 to 1.5 gallons per minute per square foot. Both undergravel and trickle filters are sensitive to power failures. If the filter ceases to operate for more than 24 hours, halting the flow of water through the biological medium, the nitrifying bacteria will begin to die. Once water flow begins again, conditions will be similar to starting a biological filter in a new set up. In fact, conditions could be worse than a new system, as the dead and putrefying bacteria could poison the tank with a fast load of ammonia upon the re-start of the tank. The best filtration must combine mechanical, biological, and chemical filtration. If only mechanical filtration is used, large particulates may be trapped in the mechanical filter medium, but there will be minimal biological filtration from the nitrifying bacteria in the mechanical filtering medium. Dissolved organic carbon such as fish waste and plant degradation will not be removed from the water and toxins can build up. This limited amount of biological filtration will be very sensitive to changes in fish load (i.e.,adding more fish or fish growth), changes in feeding rates, and even variations in water temperature. Nitrifying bacteria will have no surface to which to cling except in the mechanical filter medium. Moreover, scrupulous cleaning of the mechanical medium will wash away most of the nitrifying bacteria, leading to high ammonia levels in the water. Adding a layer of Activated Carbon for chemical filtration of organic waste will not change the fact that there is no effective and reliable method for removing nitrogenous wastes. Carbon is used to remove impurities such as chlorine, not ammonia or its by products. In a set up with only an undergravel filter, there is practically no chemical filtration for dissolved organ compounds. In addition, without an efficient mechanical filter, the nitrification bed will eventually clog with particulates. Nitrification will be reduced and life in the tank will decline. In contrast, a filtering system comprised of all three components (mechanical, chemical and biological) provides all requirements for maintaining a healthy aquarium. A typical wet dry filter does all three of these things. 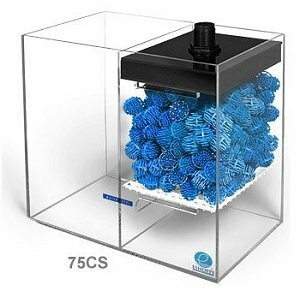 If cost is a consideration, an efficient set up consists of one outside power filter - either a hang-on-the-back unit or a canister - with separate compartments for mechanical media, GAC and ion exchange resin. It's important that the filter is large enough to accommodate the appropriate amount of filtering material. An alternative set up uses two independent filter units. An outside power filter that contains mechanical media and activated carbon to remove particulates and dissolved organic compounds is run in conjunction with an undergravel filter. Although a complete filtration system will cost a little more in the beginning, you save in the long run by avoiding the costs of replacement fish for those that died and medications for fish that become ill. More importantly, your fish will thrive and your aquarium will be more enjoyable. A properly filtered aquarium requires less maintenance than one with incomplete or inadequate filtration. No filtration system, however, can keep aquarium water as clean and healthful as it was from the tap. Over time the water quality deteriorates. Therefore, periodic water changes of 20 percent of the aquarium water are a necessary part of your total filtration system. A conscientious hobbyist can achieve the necessary good water quality with a minimal amount of effort and a good filtering design.